Methods and means are provided for producing chimeric nucleic acid constructs capable of producing dsRNA for silencing target nucleic acid sequences of interest using recombinational cloning. Methods and means for producing efficient silencing construct using recombinational cloning. Field of the invention. This invention relates to efficient methods and means for producing chimeric nucleic acid constructs capable of producing dsRNA useful for silencing target nucleic acid sequences of interest. The efficiency of the disclosed methods and means further allows high throughput analysis methods to determine the function of isolated nucleic acids, such as ESTs, without a known function and may further be put to use to isolate particular genes or nucleotide sequences from a preselected group of genes. This specification contains nucleotide and amino acid sequence information prepared using Patentln Version 3.1, presented herein after the claims. Each nucleotide sequence is identified in the sequence listing by the numeric indicator <210> followed by the sequence identifier (e.g. <210>1, <210>2, <210>3, etc). The length and type of sequence (DNA, protein (PRT), etc), and source organism for each nucleotide sequence, are indicated by information provided in the numeric indicator fields <211>, <212> and <213>, respectively. Nucleotide sequences referred to in the specification are defined by the term "SEQ ID NO:", followed by the sequence identifier (eg. SEQ ID NO: 1 refers to the sequence in the sequence listing designated as <400>1). The designation of nucleotide residues referred to herein are those recommended by the IUPAC-IUB Biochemical Nomenclature Commission, wherein A represents Adenine, C represents Cytosine, G represents Guanine, T represents thymine, Y represents a pyrimidine residue, R represents a purine residue, M represents Adenine or Cytosine, K represents Guanine or Thymine, S represents Guanine or Cytosine, W represents Adenine or Thymine, H represents a nucleotide other than Guanine, B represents a nucleotide other than Adenine, V represents a nucleotide other than Thymine, D represents a nucleotide other than Cytosine and N represents any nucleotide residue. As used herein the term "derived from" shall be taken to indicate that a specified integer may be obtained from a particular source albeit not necessarily directly from that source. Throughout this specification, unless the context requires otherwise, the word "comprise", or variations such as "comprises" or "comprising", will be understood to imply the inclusion of a stated step or element or integer or group of steps or elements or integers but not the exclusion of any other step or element or integer or group of elements or integers. Those skilled in the art will appreciate that the invention described herein is susceptible to variations and modifications other than those specifically described. It is to be understood that the invention includes all such variations and modifications. The invention also includes all of the steps, features, compositions and compounds referred to or indicated in this specification, individually or collectively, and any and all combinations or any two or more of said steps or features. The present invention is not to be limited in scope by the specific embodiments described herein, which are intended for the purposes of exemplification only. Functionally-equivalent products, compositions and methods are clearly within the scope of the invention, as described herein. The reference to any prior art in this specification is not, and should not be taken as, an acknowledgment or any form of suggestion that such prior art forms part of the common general knowledge in Australia. Increasingly, the nucleotide sequence of whole genomes of organisms, including Arabidopsis thaliana, has been determined and as these data become available they provide a wealth of unmined information. The ultimate goal of these genome projects is to identify the biological function of every gene in the genome. Attribution of a function to a nucleic acid with a particular nucleotide sequence can be achieved in a variety of ways. Some of the genes have been characterized directly using the appropriate assays. Others have been attributed with a tentative function through homology with (parts of) genes having a known function in other organisms. Loss-of-function mutants, obtained e.g. by tagged insertional mutagenesis have also been very informative about the role of some of these unknown genes (AzpiroLeehan and Feldmann 1997; Martienssen 1998) particularly in the large scale analysis of the yeast genome (Ross-MacDonald et al., 1999). Structural mutants resulting in a loss-of-function may also be mimicked by interfering with the expression of a nucleic acid of interest at the transcriptional or post- transcriptional level. Silencing of genes, particularly plant genes using anti-sense or co-suppresion constructs to identify gene function, especially for a larger number of targets, is however hampered by the relatively low proportion of silenced individuals obtained, particularly those wherein the silencing level is almost complete. Recent work has demonstrated that the silencing efficiency could be greatly improved both on quantitative and qualitative level using chimeric constructs encoding RNA capable of forming a double stranded RNA by basepairing between the antisense and sense RNA nucleotide sequences respectively complementary and homologous to the target sequences. Fire et al., 1998 describe specific genetic interference by experimental introduction of double-stranded RNA in Caenorhabditis elegans. The importance of these findings for functional genomics has been discussed (Wagner and Sun, 1998). WO 99/32619 provides a process of introducing an RNA into a living cell to inhibit gene expression of a target gene in that cell. The process may be practiced ex vivo or in vivo. The RNA has a. region with double-stranded structure. Inhibition is sequence- specific in that the nucleotide sequences of the duplex region of the RNA and or a portion of the target gene are identical. Waterhouse et al. 1998 describe that virus resistance and gene silencing in plants can be induced by simultaneous expression of sense and anti-sense RNA. The sense and antisense RNA may be located in one transcript that has self-complementarity. Hamilton et al. 1998 describes that a transgene with repeated DNA, i.e. inverted copies of its 5' untranslated region, causes high frequency, post-transcriptional suppression of ACC-oxidase expression in tomato. WO 98/53083 describes constructs and methods for enhancing the inhibition of a target gene within an organism which involve inserting into the gene silencing vector an inverted repeat sequence of all or part of a polynucleotide region within the vector. WO 99/53050 provides methods and means for reducing the phenotypic expression of a nucleic acid of interest in eukaryotic cells, particularly in plant cells, by introducing chimeric genes encoding sense and antisense RNA molecules directed towards the target nucleic acid, which are capable of forming a double stranded RNA region by base-pairing between the regions with the sense and antisense nucleotide sequence or by introducing the RNA molecules themselves. Preferably, the RNA molecules comprise simultaneously both sense and antisense nucleotide sequences. WO 99/49029 relates generally to a method of modifying gene expression and to synthetic genes for modifying endogenous gene expression in a cell, tissue or organ of a transgenic organism, in particular to a transgenic animal of plant. Synthetic genes and genetic constructs, capable of forming a dsRNA which are capable of repressing, delaying or otherwise reducing the expression of an endogenous gene or a target gene in an organism when introduced thereto are also provided. WO 99/61631 relates to methods to alter the expression of a target gene in a plant using sense and antisense RNA fragments of the gene. The sense and antisense RNA fragments are capable of pairing and forming a double-stranded RNA molecule, thereby altering the expression of the gene. The present invention also relates to plants, their progeny and seeds thereof obtained using these methods. WO 00/01846 provides a method of identifying DNA responsible for conferring a particular phenotype in a cell which method comprises a) constructing a cDNA or genomic library of the DNA of the cell in a suitable vector in an orientation relative to (a) promoter(s) capable of initiating transcription of the cDNA or DNA to double stranded (ds) RNA upon binding of an appropriate transcription factor to the promoter(s); b) introducing the library into one or more of cells comprising the transcription factor, and c) identifying and isolating a particular phenotype of a cell comprising the library and identifying the DNA or cDNA fragment from the library responsible for conferring the phenotype. Using this technique, it is also possible to assign function to a known DNA sequence by a) identifying homologues of the DNA sequence in a cell, b) isolating the relevant DNA homologus(s) or a fragment thereof from the cell, c) cloning the homologue or fragment thereof into an appropriate vector in an orientation relative to a suitable promoter capable of initiating transcription of dsRNA from said DNA homologue or fragment upon binding of an appropriate transcription factor to the promoter and d) introducing the vector into the cell from step a) comprising the transcription factor. WO 00/44914 also describes composition and methods for in vivo and in vitro attenuation of gene expression using double stranded RNA, particularly in zebrafish. WO 00/49035 discloses a method for silencing the expression of an endogenous gene in a cell, the method involving overexpressing in the cell a nucleic acid molecule of the endogenous gene and an antisense molecule including a nucleic acid molecule complementary to the nucleic acid molecule of the endogenous gene, wherein the overexpression of the nucleic acid molecule of the endogenous gene and the antisense molecule in the cell silences the expression of the endogenous gene. Smith et al., 2000 as well as WO 99/53050 described that intron containing dsRNA further increased the efficiency of silencing. However, the prior art has not solved the problems associated with the efficient conversion of any nucleotide sequence of interest into a chimeric construct capable of producing a dsRNA in eukaryotic cells, particularly in plant cells, and preferably in a way amenable to the processing of large number of nucleotide sequences. These and other problems have been solved as described hereinafter in the different embodiments and claims. It is an object of the invention to provide vectors comprising the following operably linked DNA fragments a) an origin of replication allowing replication in microorganisms (1), preferably bacteria; particularly Escherichia coli; b) a selectable marker region (2) capable of being expressed in microorganisms, preferably bacteria; and c) a chimeric DNA construct comprising in sequence (i) a promoter or promoter region (3) capable of being recognized by RNA polymerases of a eukaryotic cell, preferably a plant-expressible promoter; (ii) a first recombination site (4), a second recombination site (5), a third recombination site (6) and a fourth recombination site (7); and (iii) a 3' transcription terminating and polyadenylation region (8) functional in the eukaryotic cell; wherein the first recombination site (4) and the fourth recombination site (7) are capable of reacting with a same recombination site, preferably are identical, and the second recombination site (5) and the third recombination site (6), are capable of reacting with a same recombination site, preferably are identical; and wherein the first recombination site (4) and the second recombination site (5) do not recombine with each other or with a same recombination site or the third recombination site (6) and the fourth recombination site (7) do not recombine with each other or with a same recombination site. Optionally the vector may further include additional elements such as: a second selectable marker gene (9) between the first (4) and second recombination site (5) and/or a third selectable marker gene (10) between the third (6) and fourth recombination site (7) and/or a region flanked by intron processing signals (11). preferably an intron, functional in the eukaryotic cell, located between the second recombination site (5) and the third recombination site (6) and/or a fourth selectable marker gene (19), located between the second (5) and third recombination site (6) and/or left and right border T-DNA sequences flanking the chimeric DNA construct plant, cells, preferably located between the left and the right T-DNA border sequences and/or an origin of replication capable of functioning in Agrobacterium spp. Selectable marker genes may be selected from the group consisting of an antibiotic resistance gene, a tRNA gene, an auxotrophic marker, a toxic gene, a phenotypic marker, an antisense oligonucleotide; a restriction endonuclease; a restriction endonuclease cleavage site, an enzyme cleavage site, a protein binding site, an a sequence complementary PCR primer. Preferably the first (4) and fourth recombination site (7) are attRl comprising the nucleotide sequence of SEQ ID No 4 and the second (5) and third (6) recombination site are att~X2 comprising the nucleotide sequence of SEQ ID No 5 or the first (4) and fourth recombination site (7) are αffPl comprising the nucleotide sequence of SEQ ID No 10 and the second (5) and third (6) recombination site are αftP2 comprising the nucleotide sequence of SEQ ID No 11. It is another objective of the invention to provide a kit comprising an acceptor vector according to invention, preferably further comprising at least one recombination protein capable of recombining a DNA segment comprising at least one of the recombination sites. (4) or fourth (7) and the fifth recombination site (13) and the second (5) or third (6) and the sixth recombination site (14); b) allowing recombination to occur in the presence of at least one recombination protein, preferably selected from Int and IHF and (ii) Int, Xis, and IHF, so as to produce a reaction mixture comprising product DNA molecules, the product DNA molecule comprising in sequence: i) the promoter or promoter region (3) capable of being recognized by RNA polymerases of the eukaryotic cell; ii) a recombination site (15) which is the recombination product of the first (4) and the fifth recombination site (13); iii) the DNA fragment of interest (12); iv) a recombination site (16) which is the recombination product of the second (4) and the sixth recombination site (14); v) a recombination site (17) which is the recombination product of the third (5) and the sixth recombination site (14); vi) the DNA fragment of interest in opposite orientation (12); vii) a recombination site (18) which is the recombination product of the fourth (7) and the fifth recombination site (13); and viii) the 3' transcription terminating and polyadenylation region (8) functional in the eukaryotic cell; c) selecting the product DNA molecules, preferably in vivo. The method allows that multiple insert DNAs comprising different DNA fragments of interest are processed simultaneously. The invention also provides a method for preparing a eukaryotic non-human organism, preferably a plant, wherein the expression of a target nucleic acid of interest is reduced or inhibited, the method comprising: a) preparing a chimeric DNA construct capable of expressing a dsRNA in cells of the eukaryotic non-human organism according to methods of the invention; b) introducing the chimeric DNA construct in cells of the eukaryotic non- human organism; and c) isolating the transgenic eukaryotic organism It is also an objective of the invention to provide a method for isolating a nucleic acid molecule involved in determining a particular trait a) preparing a library of chimeric DNA constructs capable of expressing a dsRNA in cells of the eukaryotic non-human organism according to any one of the methods of the invention; b) introducing individual representatives of the library of chimeric DNA constructs in cells of the eukaryotic non-human organism; c) isolating a eukaryotic organism exhibiting the particular trait; and isolating the nucleic acid molecule. The invention also provides a eukaryotic non-human organism, preferably a plant comprising a chimeric DNA construct obtainable through the methods of the invention. Figure 1. Schematic representation of vectors and method used in a preferred embodiment of the invention. Figure 1A: A nucleic acid of interest (12) is amplified by PCR using primers comprising two different recombination sites (13, 14) which cannot react with each other or with the same other recombination site. This results in "insert DNA" wherein the nucleic acid of interest (12) is flanked by two different recombination sites (13, 14). Figure IB. Using at least one recombination protein, the insert DNA is allowed to recombine with the acceptor vector between the recombination sites, whereby the first (4) and fourth recombination site (7) react with one of the recombination sites (13) flanking the PCR amplified DNA of interest (12) and the second (5) and third (6) recombination site on the acceptor vector recombine with the other recombination site (14) flanking the DNA of interest (12). The desired product DNA can be isolated by selecting for loss of the selectable marker genes (9) and (10) located between respectively the first (4) and second (5) recombination sites and the third (6) and fourth (7) recombination sites. Optionally, an additional selectable marker gene may be included between the second (5) and third (6) recombination site to allow selection for the presence of this selectable marker gene and consequently for the optional intron sequence, which is flanked by functional intron processing signal sequences (11). The acceptor vector, as well as the product vector further comprises a origin of replication (Ori; (1)) and a selectable marker gene (2) to allow selection for the presence of the plasmid. This result in a chimeric DNA construct with the desired configuration comprising a eukaryotic promoter region (3); a recombination site (15) produced by the recombination between recombination sites (4) and (13); a first copy of the DNA of interest (12); a recombination site (16) produced by the recombination between recombination sites (5) and (14); optionally an intron sequence flanked by intron processing signals (11); a recombination site (17) produced by the recombination between recombination sites (6) and (14); a second copy of the DNA of interest (12) in opposite orientation to the first copy of the DNA of interest; a recombination site (18) produced by the recombination between recombination sites (7) and (13); a eukaryotic transcription terminator and polyadenylation signal (8). Figure 2A: A nucleic acid of interest (12) is amplified by PCR using primers comprising two different recombination sites which upon recombination with the recombination sites on an intermediate vector (Figure 2B) will yield recombination sites compatible with the first (4) and fourth (5) and with the second (6) and third (7) recombination site on the acceptor vector respectively. Figure 2B: The insert DNA obtained in Figure 2 A is allowed to recombine with the intermediate vector in the presence of at least one recombination protein to obtain an intermediate DNA wherein the DNA of interest (12) is flanked by two different recombination sites (13, 14) and which further comprises an origin of replication (1) and a selectable marker gene (2). Figure 2C: The intermediate DNA is then allowed to recombine with the acceptor vector using at least one second recombination protein (basically as described for Figure IB). Figure 3: Schematic representation of the acceptor vector "pHELLSGATE"
Figure 4: Schematic representation of the acceptor vectors "pHELLSGATE 8" "pHELLSGATE 11" and "pHELLSGATE 12". The current invention is based on the unexpected finding by the inventors that recombinational cloning was an efficient one-step method to convert a nucleic acid fragment of interest into a chimeric DNA construct capable of producing a dsRNA transcript comprising a sense and antisense nucleotide sequence capable of being expressed in eukaryotic cells. The dsRNA molecules are efficient effectors of gene- silencing. These methods improves the efficiency problems previously encountered to produce chimeric DNAs with long inverted repeats. (4) the third (6) and fourth (7) recombination site do not recombine with each other or with the same other recombination site; and iii) a 3' transcription terminating and polyadenylation region (8) functional in a eukaryotic cell. 4. Selecting the product DNA molecules. This method is schematically outlined in Figure 1, with non-limiting examples of recombination sites and selectable markers. As used herein, a "host cell" is any prokaryotic or eukaryotic organism that can be a recipient for the acceptor vector or the product DNA. Conveniently, the host cell will be a Escherichia coli strain commonly used in recombinant DNA methods. A "recombination protein" is used herein to collectively refer to site specific recombinases and associated proteins and/or co-factors. Site specific recombinases are enzymes that are present in some viruses and bacteria and have been characterized to have both endonuclease and ligase properties. These recombinases (along with associated proteins in some cases) recognize specific sequences of bases in DNA and exchange the DNA segments flanking those segments. Various recombination proteins are described in the art(see WO 96/40724 herein incorporated by reference in its entirety, at least on page 22 to 26). Examples of such recombinases include Cre from bacteriophage Pi and Integrase from bacteriophage lambda. Cre is a protein from bacteriophage Pi (Abremski and Hoess, 1984) which catalyzes the exchange between 34 bp DNA sequences called loxP sites (see Hoess et al., 1986. Cre is available commercially (Novagen, Catalog 69247-1). Integrase (Int) is a protein from bacteriophage lambda which mediates the integration of the lambda genome into the E. coli chromosome. The bacteriophage lambda Int recombinational proteins promote irreversible recombination between its substrate att sites as part of the formation or induction of a lysogenic state. Reversibility of the recombination reactions results from two independent pathways for integrative or excisive recombination. Cooperative and competitive interactions involving four proteins (Int, Xis, IHF and FIS) determine the direction of recombination. Integrative recombination involves the Int and IHF proteins and attP (240bp) and att (25b) recombination sites. Recombination results in the formation of two new sites: attL and at(R. A commercial preparation comprising Int and IHF proteins is commercially available (BP clonase™ ; Life Technologies). Excisive recombination requires Int, IHF, and Xis and sites attL and αffR to generate αttP and attB. A commercial preparation comprising Int, IHF and Xis proteins is commercially available (LR clonase™ ; Life Technologies). A "recombination site" as used herein refers to particular DNA sequences, which a recombinase and possibly associated proteins recognizes and binds. The recombination site recognized by Cre recombinase is ioxP which is a 34 base pair sequence comprised of two 13 base pair inverted repeats (serving as recombinase binding sites) flanking an 8 base pair core sequence. The recombination sites attB, attP, attL and attR are recognized by lambda integrase. AttB is an approximately 25 base pair sequence containing two 9 base pair core-type Int binding sites and a 7 base pair overlap region. AttP is an approximately 240 base pair sequence containing core- type Int binding sites and arm-type Int binding sites as well as sites for auxiliary proteins IHF, FIS and Xis (Landy 1993). Each of the att sites contains a 15 bp core sequence with individual sequence elements of functional significance lying within, outside and across the boundaries of this common core (Landy, 1989) Efficient recombination between the various att sites requires that the sequence of the central common region is substantially identical between the recombining partners. The exact sequence however is modifiable as disclosed in WO 96/40724 and the variant recombination sites selected from i) attBV. AGCCTGCTTTTTTGTACAAACTTGT (SEQ ID No 1); ii) α fB2: AGCCTGCTTTCTTGTACAAACTTGT (SEQ ID No 2); iii) attB': ACCCAGCTTTCTTGTACAAACTTGT (SEQ ID No 3); iv) attRl GTTCAGCTTTTTTGTACAAACTTGT (SEQ ID No 4) ; v) αffR2: GTTCAGCTTTCTTGTACAAACTTGT (SEQ ID No 5); vi) attR3: GTTCAGCTTTCTTGTACAAAGTTGG (SEQ ID No 6); vii) attLV. AGCCTGCTTTTTTGTACAAAGTTGG (SEQ ID No 7); viii) attL2: AGCCTGCTTTCTTGTACAAAGTTGG (SEQ ID No 8); ix) attL3: ACCCAGCTTTCTTGTACAAAGTTGG (SEQ ID No 9); x) attPl: GTTCAGCTTTTTTGTACAAAGTTGG (SEQ ID No 10) ; or xi) αffP2,P3: GTTCAGCTTTCTTGTACAAAGTTGG (SEQ ID No 11) allow more flexibility in the choice of suitable pairs or recombination sites which are capable to recombine (as indicated by their index number). It will be clear to the skilled artisan that a correspondence is required between the recombination site(s) used and the recombination proteins used. In one embodiment the following combinations of recombination sites for the acceptor vector are present in the acceptor vector: - the first (4) and fourth (7) recombination sites are identical and comprise attPl comprising the nucleotide sequence of SEQ ID No 10 and the second (5) and third (6) recombination site are also identical and comprise αttP2 comprising the nucleotide sequence of SEQ ID No 11; or the first (4) and fourth (7) recombination sites are identical and comprise attRl comprising the nucleotide sequence of SEQ ID No 4 and the second (5) and third (6) recombination site are also identical and comprise attR2 comprising the nucleotide sequence of SEQ ID No 5; and the following combinations of recombination sites for the insert DNA are used: the fifth (13) recombination site comprises attBl comprising the nucleotide sequence of SEQ ID No 1 and the sixth (14) recombination site comprises attB2 comprising the nucleotide sequence of SEQ ID No 2, the combination being suitable for recombination with the first acceptor vector mentioned above; or the fifth (13) recombination site comprises αftLl comprising the nucleotide sequence of SEQ ID No 7 and the sixth (14) recombination site comprises attLl comprising the nucleotide sequence of SEQ ID No 8, the combination being suitable for recombination with the second acceptor vector mentioned above. It has been unexpectedly found that product DNA molecules (resulting from recombination between the above mentioned second acceptor vector with attR recombination sites (such as pHELLSGATE 8) and insert DNA flanked by attL recombination sites) wherein the gene inserts in both orientations are flanked by attB recombination sites are more effective in silencing of the target gene(both quantitatively and qualitatively) than product DNA molecules (resulting from recombination between the above mentioned first acceptor vector with attP recombination sites (such as pHELLSGATE or pHELLSGATE 4) and insert DNA flanked by attB recombination sites) wherein the gene inserts in both orientations are flanked by attL recombination sites. Although not intending to limit the invention to a particular mode of action it is thought that the greater length of the attL sites and potential secondary structures therein may act to inhibit transcription yielding the required dsRNA to a certain extent. However, acceptor vectors such as the above mentioned first acceptor vectors with attP sites may be used when target gene silencing to a lesser extent would be useful or required. The dsRNA obtained by the chimeric DNA construct made according to the invention may be used, to silence a nucleic acid of interest, i.e. reduce its phenotypic expression, in a eukaryotic organism, particularly a plant, either directly or by transcription of the chimeric DNA construct in the cells of the eukaryotic organism. When this is the case, the following considerations may apply. The length of the nucleic acid of interest (12) may vary from about 10 nucleotides (nt) up to a length equaling the length (in nucleotides) of the target nucleic acid whose phenotypic expression is to be reduced. Preferably the total length of the sense nucleotide sequence is at least 10 nt, or at least 19 nt or at least 21 nt or at least 25 nt, or at least about 50 nt, or at least about 100 nt, or at least about 150 nt, or at least about 200 nt, or at least about 500 nt. It is expected that there is no upper limit to the total length of the sense nucleotide sequence, other than the total length of the target nucleic acid. However for practical reason (such as e.g. stability of the chimeric genes) it is expected that the length of the sense nucleotide sequence should not exceed 5000 nt, particularly should not exceed 2500 nt and could be limited to about 1000 nt. It will be appreciated that the longer the total length of the nucleic acid of interest (12), the less stringent the requirements for sequence identity between the nucleic acid of interest and the corresponding sequence in the target gene. Preferably, the nucleic acid of interest should have a sequence identity of at least about 75% with the corresponding target sequence, particularly at least about 80 %, more particularly at least about 85%, quite particularly about 90%, especially about 95%, more especially about 100%, quite especially be identical to the corresponding part of the target nucleic acid. However, it is preferred that the nucleic acid of interest always includes a sequence of about 10 consecutive nucleotides, particularly about 25 nt, more particularly about 50 nt, especially about 100 nt, quite especially about 150 nt with 100% sequence identity to the corresponding part of the target nucleic acid. Preferably, for calculating the sequence identity and designing the corresponding sense sequence, the number of gaps should be minimized, particularly for the shorter sense sequences. For the purpose of this invention, the "sequence identity" of two related nucleotide or amino acid sequences, expressed as a percentage, refers to the number of positions in the two optimally aligned sequences which have identical residues (xlOO) divided by the number of positions compared. A gap, i.e. a position in an alignment where a residue is present in one sequence but not in the other is regarded as a position with non-identical residues. The alignment of the two sequences is performed by the Needleman and Wunsch algorithm (Needleman and Wunsch 1970) The computer- assisted sequence alignment above, can be conveniently performed using standard software program such as GAP which is part of the Wisconsin Package Version 10.1 (Genetics Computer Group, adision, Wisconsin, USA) using the default scoring matrix with a gap creation penalty of 50 and a gap extension penalty of 3. Sequences are indicated as "essentially similar" when such sequence have a sequence identity of at least about 75%, particularly at least about 80 %, more particularly at least about 85%, quite particularly about 90%, especially about 95%, more especially about 100%, quite especially are identical. It is clear than when RNA sequences are the to be essentially similar or have a certain degree of sequence identity with DNA sequences, thymine (T) in the DNA sequence is considered equal to uracil (U) in the RNA sequence. The "insert DNA" may conveniently be provided using DNA amplification procedures, such as PCR, of the nucleic acid of interest, using as primers oligonucleotide sequences incorporating appropriate recombination sites as well as oligonucleotide sequences appropriate for the amplification of the nucleic acid of interest. However, alternative methods are available in the art to provide the nucleic acid of interest with the flanking recombination sites, including but not limited to covalently linking oligonucleotides or nucleic acid fragments comprising such recombination sites to the nucleic acid(s) of interest using ligase(s). The providing of the appropriate flanking recombination sites to the nucleic acid may also proceed in several steps. E.g. in a first step the flanking sites provided to the nucleic acid of interest may be such that upon recombination with the recombination sites in an intermediate vector new recombination sites are created flanking the nucleic acid of interest, now compatible for recombination with the acceptor vector. This scheme is outlined in Figure 2, with non-limiting examples of recombination sites and selectable markers. It goes without saying that the insert DNA may be in a circular form or in a linear form. As used herein, an "origin of replication" is a DNA fragment which allows replication of the acceptor vector in microorganisms, preferably bacteria, particularly E. coli strains, and ensures that upon multiplication of the microorganism, the daughter cells receive copies of the acceptor vector. Preferred first selectable markers (2) are antibiotic resistance genes. A large number of antibiotic resistance genes, particularly which can be used in bacteria, are available in the art and include but are not limited to aminoglycoside phosphotransferase I and π, chloramphenicol acetyltransferase, beta-lactamase, aminoglycoside adenosyltransf erase. Preferred second selectable marker (9) and third selectable markers (10) are selectable markers allowing a positive selection when absent or deleted after recombination (i.e. in the product DNA) such as but not limited to ccdB gene the product of which interferes with E. coli DNA gyrase and thereby inhibits growth of most E. coli strains. Preferably, the second and third marker are identical. In one embodiment of the invention, the acceptor comprises a fourth selectable marker (19) between the second (5) and third (6) recombination site, preferably a marker allowing positive selection for the presence thereof, such as a antibiotic resistance gene, e.g. chloramphenicol resistance gene. Preferably, the fourth selectable marker should be different from first selectable marker and different from the second and third selectable marker. The presence of a fourth selectable marker allows to select or screen for the retention of the DNA region between the second (5) and third (6) recombination site in the product DNA, thereby increasing the efficiency with which the desired product DNAs having the nucleic acid of interest cloned in inverted repeat and operably linked to eukaryotic expression signals may be obtained. However, it has been found that with most of the acceptor vectors tested, the presence of a selectable marker is not required and has little influence on the ratio of expected and desired product DNA molecules (which usually exceeds about 90% of obtained product DNA molecules) to undesired product DNA molecules. It goes without saying that a person skilled in the art has a number of techniques available for recognizing the expected and desired product DNA molecules, such as but not limited to restriction enzyme digests or even determining the nucleotide sequence of the recombination product. In another embodiment of the invention, the acceptor vector further comprises a pair of intron processing signals (11) or an intron sequence functional in the eukaryotic cell, preferably located between the second (5) and third (6) recombination site. However, the pair of intron processing signals or the intron may also be located elsewhere in the chimeric construct between the promoter or promoter region (3) and the terminator region (8). As indicated in the background art, this will improve the efficiency with which the chimeric DNA construct encoding the dsRNA will be capable of reducing the phenotypic expression of the target gene in the eukaryotic cell. A particularly preferred intron functional in cells of plants is the pdk intron (Flaveήa tπnervia pyruvate orthophosphate dikinase intron 2 ; see WO99/53050 incorporated by reference). The fourth selectable marker (19) may be located between the intron processing signals or within the intron (if these are located between the second and third recombination site), but may also be located adjacent to the intron processing signals or the intron. A person skilled in the art will recognize that the product DNA molecules resulting from a recombination with an acceptor vector as herein described which comprise a region between the second (5) and third (6) recombination will fall into two classes which can be recognized by virtue of the orientation of that intervening region. In the embodiments wherein the acceptor vector also comprises an intron, the different orientation may necessitate an additional step of identifying the correct orientation. To avoid this additional step, the acceptor vector may comprise an intron which can be spliced out independent of its orientation (such as present in pHELLSGATE 11) or the acceptor vector may comprise an spliceable intron in both orientations (such as present in pHELLSGATE 12). As used herein, the term "promoter" denotes any DNA which is recognized and bound (directly or indirectly) by a DNA-dependent RNA-polymerase during initiation of transcription. A promoter includes the transcription initiation site, and binding sites for transcription initiation factors and RNA polymerase, and can comprise various other sites (e.g., enhancers), at which gene expression regulatory proteins may bind. The term "regulatory region", as used herein, means any DNA, that is involved in driving transcription and controlling (i.e., regulating) the timing and level of transcription of a given DNA sequence, such as a DNA coding for a protein or polypeptide. For example, a 5' regulatory region (or "promoter region") is a DNA sequence located upstream (i.e., 5') of a coding sequence and which comprises the promoter and the 5'-untranslated leader sequence. A 3' regulatory region is a DNA sequence located downstream (i.e., 3') of the coding sequence and which comprises suitable transcription termination (and/or regulation) signals, including one or more polyadenylation signals. As used herein, the term "plant-expressible promoter" means a DNA sequence which is capable of controlling (initiating) transcription in a plant cell. This includes any promoter of plant origin, but also any promoter of non-plant origin which is capable of directing transcription in a plant cell, i.e., certain promoters of viral or bacterial origin such as the CaMV35S, the subterranean clover virus promoter No 4 or No 7, or T-DNA gene promoters but also tissue-specific or organ-specific promoters including but not limited to seed-specific promoters (e.g., WO89/03887), organ-primordia specific promoters (An et al., 1996), stem-specific promoters (Keller et al, 1988), leaf specific promoters (Hudspeth et al., 1989), mesophyl-specific promoters (such as the light-inducible Rubisco promoters), root-specific promoters (Keller et al.,1989), tuber- specific promoters (Keil et al., 1989), vascular tissue specific promoters ( Peleman et al., 1989 ), stamen-selective promoters ( WO 89/10396, WO 92/13956), dehiscence zone specific promoters ( WO 97/13865) and the like. The acceptor vector may further comprise a selectable marker for expression in a eukaryotic cell. Selectable marker genes for expression in eukaryotic cells are well known in the art, including but not limited to chimeric marker genes. The chimeric marker gene can comprise a marker DNA that is operably linked at its 5' end to a promoter, functioning in the host cell of interest, particularly a plant-expressible promoter, preferably a constitutive promoter, such as the CaMV 35 S promoter, or a light inducible promoter such as the promoter of the gene encoding the small subunit of Rubisco; and operably linked at its 3' end to suitable plant transcription 3' end formation and polyadenylation signals. It is expected that the choice of the marker DNA is not critical, and any suitable marker DNA can be used. For example, a marker DNA can encode a protein that provides a distinguishable colour to the transformed plant cell, such as the Al gene (Meyer et al., 1987), can provide herbicide resistance to the transformed plant cell, such as the bar gene, encoding resistance to phosphinothricin (EP 0,242,246), or can provide antibiotic resistance to the transformed cells, such as the aac(&) gene, encoding resistance to gentamycin (WO94/01560). The acceptor vector may also further comprise left and right T-DNA border sequences flanking the chimeric DNA construct, and may comprise an origin of replication functional in Agrobacteήum spp. and/or a DNA region of homology with a helper Ti- plasmid as described in EP 0 116 718. The efficiency and ease by which any nucleic acid of interest may be converted into a chimeric DNA construct comprising two copies of the nucleic acid of interest in inverted repeat and operably linked to eukaryotic 5' and 3' regulatory regions using the means and methods according to the invention, makes these particularly apt for automation and high throughput analysis. (4) the third (6) and fourth (7) recombination site do not recombine with each other or with the same other recombination site; and (5) a 3' transcription terminating and polyadenylation region (8) functional in a eukaryotic cell. The acceptor vector may be used to convert a DNA fragment of interest into an inverted repeat structure as described elsewhere in the application and dsRNA can be produced in large amounts by contacting the acceptor vector DNA with the appropriate bacteriophage single subunit RNA polymerase under conditions well known to the skilled artisan. The so-produced dsRNA can then be used for delivery into cells prone to gene silencing, such as plant cells, fungal cells or animal cells. dsRNA may be introduced in animal cells via liposomes or other transfection agents (e.g. Clonfection transfection reagent or the CalPhos Mammalian transfection kit from ClonTech) and could be used for methods of treatment of animals, including humans, by silencing the appropriate target genes. The acceptor vectors may also be equipped with any prokaryotic promoter suitable for expression of dsRNA in a particular prokaryotic host. The prokaryotic host can be used as a source of dsRNA, e.g. by feeding it to an animal, such as a nematode, in which the silencing of the target gene is envisioned. The promoter capable of expression in eukaryotic cell may also be a promoter capable of expression in a mammalian cell and vectors according to the invention may transiently be delivered using a retroviral delivery system or other animal transfection system. In another embodiment of the invention, a method is provided for making a eukaryotic organism, particularly a plant, wherein the phenotypic expression of a target nucleic acid of interest is reduced or inhibited, comprising the steps of preparing a chimeric DNA construct comprising a nucleic acid of interest (12) comprising a nucleotide sequence of at least 19 bp or 25 bp having at least 70% sequence identity to the target nucleic acid of interest and capable of expressing a dsRNA in cells of the eukaryotic organism, particularly a plant according to the methods of the current invention and introducing the chimeric DNA construct in cells of the eukaryotic organism, and isolating eukaryotic organism transgenic for the chimeric DNA construct. As used herein, "phenotypic expression of a target nucleic acid of interest" refers to any quantitative trait associated with the molecular expression of a nucleic acid in a host cell and may thus include the quantity of RNA molecules transcribed or replicated, the quantity of post-transcriptionally modified RNA molecules, the quantity of translated peptides or proteins, the activity of such peptides or proteins. A "phenotypic trait" associated with the phenotypic expression of a nucleic acid of interest refers to any quantitative or qualitative trait, including the trait mentioned, as well as the direct or indirect effect mediated upon the cell, or the organism containing that cell, by the presence of the RNA molecules, peptide or protein, or posttranslationally modified peptide or protein. The mere presence of a nucleic acid in a host cell, is not considered a phenotypic expression or a phenotypic trait of that nucleic acid, even though it can be quantitatively or qualitatively traced. Examples of direct or indirect effects mediated on cells or organisms are, e.g., agronomically or industrial useful traits, such as resistance to a pest or disease; higher or modified oil content etc. As used herein, "reduction of phenotypic expression" refers to the comparison of the phenotypic expression of the target nucleic acid of interest to the eucaryotic cell in the presence of the RNA or chimeric genes of the invention, to the phenotypic expression of the target nucleic acid of interest in the absence of the RNA or chimeric genes of the invention. The phenotypic expression in the presence of the chimeric RNA of the invention should thus be lower than the phenotypic expression in absence thereof, preferably be only about 25%, particularly only about 10%, more particularly only about 5% of the phenotypic expression in absence of the chimeric RNA, especially the phenotypic expression should be completely inhibited for all practical purposes by the presence of the chimeric RNA or the chimeric gene encoding such an RNA. A reduction of phenotypic expression of a nucleic acid where the phenotype is a qualitative trait means that in the presence of the chimeric RNA or gene of the invention, the phenotypic trait switches to a different discrete state when compared to a situation in which such RNA or gene is absent. A reduction of phenotypic expression of a nucleic acid may thus, a. be measured as a reduction in transcription of (part of) that nucleic acid, a reduction in translation of (part of) that nucleic acid or a reduction in the effect the presence of the transcribed RNA(s) or translated polypeptide (s) have on the eucaryotic cell or the organism, and will ultimately lead to altered phenotypic traits. It is clear that the reduction in phenotypic expression of a target nucleic acid of interest, may be accompanied by or correlated to an increase in a phenotypic trait. As used herein a "target nucleic acid of interest" refers to any particular RNA molecule or DNA sequence which may be present in a eucaryotic cell, particularly a plant cell whether it is an endogenous nucleic acid, a transgenic nucleic acid, a viral nucleic acid, or the like. Methods for making transgenic eukaryotic organisms, particularly plants are well known in the art. Gene transfer can be carried out with a vector that is a disarmed Ti- plasmid, comprising a chimeric gene of the invention, and carried by Agrobacterium. This transformation can be carried out using the procedures described, for example, in EP 0 116 718. A particular kind of Agrobacterium mediated transformation methods are the so-called in planta methods, which are particularly suited for Arabidopsis spp. transformation (e.g. Clough and Bent 1998). Alternatively, any type of vector can be used to transform the plant cell, applying methods such as direct gene transfer (as described, for example, in EP 0 233 247), pollen-mediated transformation (as described, for example, in EP 0 270 356, WO85/01856 and US 4,684,611), plant RNA virus-mediated transformation (as described, for example, in EP 0 067 553 and US 4,407,956), liposome-mediated transformation (as described, for example, in US 4,536,475), and the like. Other methods, such as microprojectile bombardment, as described for corn by Fromm et al. (1990) and Gordon-Kamm et al. (1990), are suitable as well. Cells of monocotyledonous plants, such as the major cereals, can also be transformed using wounded and/or enzyme-degraded compact embryogenic tissue capable of forming compact embryogenic callus, or wounded and/or degraded immature embryos as described in WO92/09696. The resulting transformed plant cell can then be used to regenerate a transformed plant in a conventional manner. The obtained transformed plant can be used in a conventional breeding scheme to produce more transformed plants with the same characteristics or to introduce the chimeric gene for reduction of the phenotypic expression of a nucleic acid of interest of the invention in other varieties of the same or related plant species, or in hybrid plants. Seeds obtained from the transformed plants contain the chimeric genes of the invention as a stable genomic insert. In another embodiment the invention provides a method for isolating a nucleic acid molecule involved in determining a particular phenotypic trait of interest. The method involves the following steps: a) preparing a library of chimeric DNA constructs capable of expressing a dsRNA in cells of the eukaryotic non-human organism using the methods and means described in the current invention; b) introducing individual representatives of this library of chimeric DNA constructs in cells of the eukaryotic non-human organism, preferably by stable integration in their genome, particularly their nuclear genome; c) isolating a eukaryotic organism exhibiting the particular trait; and d) isolating the corresponding nucleic acid molecule present in the eukaryotic organism with the trait of interest, preferably from the aforementioned library. It goes without saying that the methods and means of the invention may be used to determine the function of an isolated nucleic acid fragment or sequence with unknown function, by converting a part or the whole of that nucleic acid fragment or sequence according to the methods of the invention into a chimeric construct capable of making a dsRNA transcript when introduced in a eukaryotic cell, introducing that chimeric DNA construct into a eukaryotic organism to isolate preferably a number of transgenic organisms and observing changes in phenotypic traits. The invention also provides acceptor vectors, as described in this specification as well as kits comprising the such vectors. It goes without saying that the vectors, methods and kits according to the invention may be used in all eukaryotic organisms which are prone to gene silencing including yeast, fungi, plants, animals such as nematodes, insects and arthropods, vertebrates including mammals and humans. (7) recombination site on the acceptor vector and the fifth recombination site (13) flanking the DNA of interest; and viii) a 3' transcription terminating and polyadenylation region (8) functional in a eukaryotic cell. As used herein "comprising" is to be interpreted as specifying the presence of the stated features, integers, steps or components as referred to, but does not preclude the presence or addition of one or more features, integers, steps or components, or groups thereof. Thus, e.g., a nucleic acid or protein comprising a sequence of nucleotides or amino acids, may comprise more nucleotides or amino acids than the actually cited ones, i.e., be embedded in a larger nucleic acid or protein. A chimeric gene comprising a DNA region which is functionally or structurally defined, may comprise additional DNA regions etc. The term "gene" means any DNA fragment comprising a DNA region (the "transcribed DNA region") that is transcribed into a RNA molecule (e.g., a mRNA) in a cell operably linked to suitable regulatory regions, e.g., a plant-expressible promoter. A gene may thus comprise several operably linked DNA fragments such as a promoter, a 5' leader sequence, a coding region, and a 3' region comprising a polyadenylation site. A plant gene endogenous to a particular plant species (endogenous plant gene) is a gene which is naturally found in that plant species or which can be introduced in that plant species by conventional breeding. A chimeric gene is any gene which is not normally found in a plant species or, alternatively, any gene in which the promoter is not associated in nature with part or all of the transcribed DNA region or with at least one other regulatory region of the gene. The term "expression of a gene" refers to the process wherein a DNA region which is operably linked to appropriate regulatory regions, particularly to a promoter, is transcribed into an RNA which is biologically active i.e., which is either capable of interaction with another nucleic acid or which is capable of being translated into a polypeptide or protein. A gene is the to encode an RNA when the end product of the expression of the gene is biologically active RNA, such as e.g. an antisense RNA, a ribozyme or a replicative intermediate. A gene is the to encode a protein when the end product of the expression of the gene is a protein or polypeptide. A nucleic acid is "capable of being expressed", when the nucleic acid, when introduced in a suitable host cell, particularly in a plant cell, can be transcribed (or replicated) to yield an RNA, and/or translated to yield a polypeptide or protein in that host cell. The following non-limiting Examples describe the construction of acceptor vectors and the application thereof for the conversion of nucleic acid fragments of interest into chimeric DNA constructs capable of expressing a dsRNA transcript in eukaryotic cells. Unless stated otherwise in the Examples, all recombinant DNA techniques are carried out according to standard protocols as described in Sambrook et al. (1989) Molecular Cloning: A Laboratory Manual, Second Edition, Cold Spring Harbor Laboratory Press, NY and in Volumes 1 and 2 of Ausubel et al. (1994) Current Protocols in Molecular Biology, Current Protocols, USA. Standard materials and methods for plant molecular work are described in Plant Molecular Biology Labfax (1993) by R.D.D. Croy, jointly published by BIOS Scientific Publications Ltd (UK) and Blackwell Scientific Publications, UK. Other references for standard molecular biology techniques include Sambrook and Russell (2001) Molecular Cloning: A Laboratory Manual, Third Edition, Cold Spring Harbor Laboratory Press, NY, Volumes I and π of Brown (1998) Molecular Biology LabFax, Second Edition, Academic Press (UK). Standard materials and methods for polymerase chain reactions can be found in Dieffenbach and Dveksler (1995) PCR Primer: A Laboratory Manual, Cold Spring Harbor Laboratory Press, and in McPherson at al. (2000) PCR - Basics: From Background to Bench, First Edition, Springer Verlag, Germany. SEQID No l3: nucleotide sequence of the acceptor vector "pHELLSGATE" SEQID No l4: oligonucleotide attBl "forward" primer used for amplification of 400bp and 200 bp CHS fragments. 8" SEQ ID No 25: nucleotide sequence of the acceptor vector "pHELLSGATE 11"
With the completion of the Arabidopsis genome project, the advent of micro-array technology and the ever-increasing investigation into plant metabolic, perception, and response pathways, a rapid targeted way of silencing genes would be of major assistance. The high incidence and degree of silencing in plants transformed with chimeric genes containing simultaneously a sense and antisense nucleotide sequence, as well as a functional intron sequence suggested that such vectors could form the basis of a high-throughput silencing vector. However, one of the major obstacles in using such conventional cloning vectors for a large number of defined genes or a library of undefined genes would be cloning the hairpin arm sequences for each gene in the correct orientations. Attempts to clone PCR products of sense and antisense arms together with the appropriately cut vector as a single step four-fragment ligation failed to give efficient or reproducible results. Therefore a construct (pHELLSGATE) was made to take advantage of Gateway™ (Life Technologies). With this technology, a PCR fragment is generated, bordered with recombination sites (attBl and attBl) which is directionally recombined, in vitro, into a plasmid containing two sets of suitable recombination sites (αftPl and αftP2 sites) using the commercially available recombination protein preparation. The pHELLSGATE vector was designed such that a single PCR product from primers with the appropriate attBl and attBl sites would be recombined into it simultaneously to form the two arms of the hairpin. The ccdB gene, which is lethal in standard E.coli strains such as DH5 (but not in DB3.1), was placed in the locations to be replaced by the arm sequences, ensuring that only recombinants containing both arms would be recovered. Placing a chloramphenicol resistance gene within the intron, gives a selection to ensure the retention of the intron in the recombinant plasmid. The complete nucleotide sequence of pHELLSGATE is represented in the sequence listing (SEQ ID No 13) and a schematic figure can be found in Figure 3. Example 2 Use of the pHELLSGATE to convert nucleic acid fragments of interest into dsRNA producing chimeric silencing genes. To test the acceptor vector pHELLSGATE an about 400bp, 200bp, lOObp, 50 bp and 25 bp fragment of the Arabidopsis thaliana chalcone synthase isomerase coding sequence (Seq ID No 12) (having respectively the nucleotide sequence of SEQ ID No 12 from the nucleotide at position 83 to the nucleotide at position 482; the nucleotide sequence of SEQ ID No 12 from the nucleotide at position 83 to the nucleotide at position 222; the nucleotide sequence of SEQ ID No 12 from the nucleotide at position 83 to the nucleotide at position 182; the nucleotide sequence of SEQ ID No 12 from the nucleotide at position 83 to the nucleotide at position 132 ; and the nucleotide sequence of SEQ ID No 12 from the nucleotide at position 83 to the nucleotide at position 107) were used as nucleic acid fragments of insert for construction of chimeric genes capable of producing dsRNA. This gene was chosen because its mutant allele has been reported in Arabidopsis to give distinct phenotypes. The CHS tt4(85) EMS mutant (Koornneef, 1990) produces inactive CHS resulting in no anthocyanin pigment in either the stem or seed-coat. Wildtype plants produce the purple-red pigment in both tissues. In a first step, the respective fragments were PCR amplified using specific primers further comprising attBl and attBl recombination sites. AttBl and αftB2 specific primers were purchased from Life Technologies. The 25 and 50 bp fragments flanked by att sites were made by dimerization of the primers. GGGGACCACTTTGTACAAGAAAGCTGGGTCGCTTGACGGAAGGACGGAGACCAAG AAGC (SEQ ID No l5). GGGGACCACTTTGTACAAGAAAGCTGGGTAACTTCTCCTTGAGGTCGGTCATGTG TTCACTGTTGGTGATGCGGAAGTAGTAGTCAGGATACTCCGCCTG (SEQID No 18). GGGGACCACTTTGTACAAGAAAGCTGGGTGTAGTCAGGATACTCCGCCTGAAGCA CATGGTTCTCAGGGTTAGCAGTGC (SEQID No 20). PCR amplification and recombination using the GATEWAY™ technology with the commercially available BP Clonase (Life Technologies) were performed according to the manufacturer's instructions (manual available on http://www.lifetech.com content. cfm?pageid= 2497) . Bacterial colonies obtained on chloramphenicol-containing plates spread with E. coli DH5α bacteria, transformed (by electroporation or by heatshocking RbCl2 treated competent E. coli cells) with the in vitro recombination reaction were screened. Colonies containing the desired recombinant plasmid were obtained in each case. For the about 400 bp fragment 24 colonies were screened and 23 contained the desired construct with the 400 bp in inverted repeat, operably linked to the CaMV35S promoter. For the about 200 bp fragment 36 colonies were screened and 35 contained the desired construct with the 200 bp in inverted repeat, operably linked to the CaMV35S promoter. For the about 50 bp fragment 6 colonies were screened and 4 contained the desired construct with the 50 bp in inverted repeat, operably linked to the CaMV35S promoter. For the 25 bp fragment, 6 colonies were screened and 1 contained the desired construct with the 400 bp in inverted repeat, operably linked to the CaMV35S promoter. In a number of cases the structure was confirmed by sequence analysis. These results show that this vector facilitates the rapid, efficient, and simple production of hpRNA (hairpin RNA constructs). pHELLSGATE is a T-DNA vector, with a high-copy-number origin of replication for ease of handling. Recombinant pHELLSGATE constructs can be directly transformed into Agrobacterium for transformation of the chimeric construct into plants. This system can be used in high throughput applications. Example 3 Evaluation of plants comprising the chimeric genes of Example 2. The vectors containing the dsRNA producing chimeric constructs with the 400, 200, 100, 50 and 25 nucleotides of chalcone synthase in inverted repeat (Example 2) were introduced into Agrobacteήum tumefaciens strain AGLl, GV3101 or LBA4404 either by electroporation or tri-parental mating. Transgenic Arabidopsis lines are obtained by transformation with these Agrobacteria using the dipping method of Clough and Bent (1998). Chalcone synthase activity is monitored by visual observation of stem and leaf color (normally in plants grown under high light, and by unaided or microscope assisted visual observation of seed-coat color. Most of the transgenic lines transformed with the above mentioned GHS silencing constructs show pronounced silencing. The seed colour of most of these lines is virtually indistinguishable from seed of the tt4(85) mutant to the naked eye . Examination of the seed under a light microscope reveals that the degree of pigmentation is generally uniform in the cells of the coat of an individual seed, and among seeds of the same line. Construction of the acceptor vectors pHELLSGATE 4, pHELLSGATE 8, pHELLSGATE 11 and pHELLSGATE 12. pHELLSGATE 4 was made by excising the DNA fragment comprising the pdk intron and chloramphenicol resistance gene from pHELLSGATE (Example 1) with MndDI and EcoRI and replacing it with a HindJUjEcoRl DNA fragment containing only the pdk intron. The complete nucleotide sequence of pHELLSGATE 4 is represented in the sequence listing (SEQ ID No 23). 5'GGCTCGAGACCACTTTGTACAAGAAAGC 3' as primers. These primers modify the attP sites within pHellsgate to attR sites. The resulting fragment was sequenced and inserted into the Xhol site of a vector upstream of a DNA fragment containing the pdk intron fragment. Similarly an Xbάl/Xbal fragment amplified with the oligonucleotides S'GGGTCTAGACAAGTTTGTACAAAAAAGCTG 3' and 5' GGGTCTAGACCACTTTGTACAAGAAAGC 3' as primers and pHEHSGATE as template DNA to modify the attP sites of this cassette to attR sites. This fragment was sequenced and inserted into the .Xbαl site of the intermediate described above downstream of the pdk intron. The complete nucleotide sequence of pHELLSGATE 8 is represented in the sequence listing (SEQ ID No 24) and a schematic figure can be found in Figure 4. pHELLSGATE 11 is similar to pHELLSGATE 8 except that the pdk intron has been engineered to contain a branching point in the complementary strand such that splicing of the intron is independent of its orientation (a so-called "two-way intron"). The complete nucleotide sequence of pHELLSGATE 11 is represented in the sequence listing (SEQ ID No 25) and a schematic representation thereof can be found in Figure 4.
pHELLSGATE 12 is also similar to pHELLSGATE 8 except that the pdk intron has been duplicated as an inverted repeat. The complete nucleotide sequence of pHELLSGATE 12 is represented in the sequence listing (SEQ ID No 26) and a schematic representation thereof can be found in Figure 4. Use of the different pHELLSGATE vectors to generate dsRNA chimeric silencing genes targeted towards three different model target genes. The efficiency in gene silencing of the different pHELLSGATE vectors was tested by inserting fragments of three target genes Flowering locus C (FLC) Ethylene insensitive 2 (EIN2) and Phytoene desaturase (PDC). For FLC a 390 bp fragment was used (from the nucleotide at position 303 to the nucleotide at position 692 of the nucleotide sequence available as Genbank Accession Nr AF116527) . For EIN2 a 580 bp fragment was used (from the nucleotide at position 541 to the nucleotide at position 1120 of the nucleotide sequence available as Genbank Accession Nr AF141203). For PDS a 432 bp fragment was used (from the nucleotide at position 1027 to the nucleotide at position 1458 of the nucleotide sequence available as Genbank Accession Nr Ll6237). Genes of interest were amplified using gene specific primers with either a 5' attBl extension (GGGGACAAGTTTGTACAAAAAAGCAGGCT) or an attB2 extension (GGGACCACTTTGTACAAGAAAGCTGGGT) using Fl Taq DNA polymerase (Fisher Biotec, Subiaco, WA, Australia) according to the manufacturer's protocol. PCR products were precipitated by adding 3 volumes TE and two volumes 30% (w/v) PEG 3000, 30mM MgCl2 and centrifuging at 13000 g for 15 minutes. Recombination reaction of PCR products with either pDONR20l (Invitrogen, Groningen, The Netherlands) or pHELLSGATE 4 were carried out in a total volume of 10 μL with 2 μL BP clonase buffer (Invitrogen), 1-2 μL PCR product 150 ng plasmid vector and 2 μL BP clonase (Invitrogen). The reaction was incubated at room temperature (25°C) for 1 h to overnight. After the incubation, 1 μL proteinase K (2 μg/μL; Invitrogen) was added and incubated for 10 min at 37°C. 1-2 μL of the mix was used to transform DH5α, colonies were selected on the appropriate antibiotics. Clones were checked either by digestion of DNA minipreps or PCR. Recombination reactions from pDONR201 clones to pHellsgate 8, 11 or 12 were carried out in 10 μL total volume with 2 μL LR clonase buffer (Invitrogen), 2 μL pDONR201 clone (approximately 150 ng), 300 ng pHellsgate 8, 11 or 12 and 2 μL LR clonase (Invitrogen). The reaction was incubated overnight at room temperature, proteinase-treated and used to transform E. coli DH5α as for the BP clonase reaction. Transformation of Arabidopsis was perfomed according to via the floral dip method (Clough and Bent, 1998). Plants were selected on agar solidified MS media supplemented with 100 mg/1 timentin and 50 mg/1 kanamycin. For FLC and PDS constructs the C24 ecotype was used; for EIN2 constructs Landsberg erecta was used. For scoring of EIN2 phenotypes transformed Tl plants were transferred to MS media containing 50 μM 1-aminocyclopropane-l-carboxylic acid (ACC) together with homozygous EZ 2-silenced lines and wild type Landberg erecta plants. Tl FLC hpRNA plants were scored by transferring to MS plates and scoring days to flower or rosette leaves at flowering compared to C24 wild type plants andflc mutant lines. Tl PDS hpRNA plants were scored by looking at bleaching of the leaves. 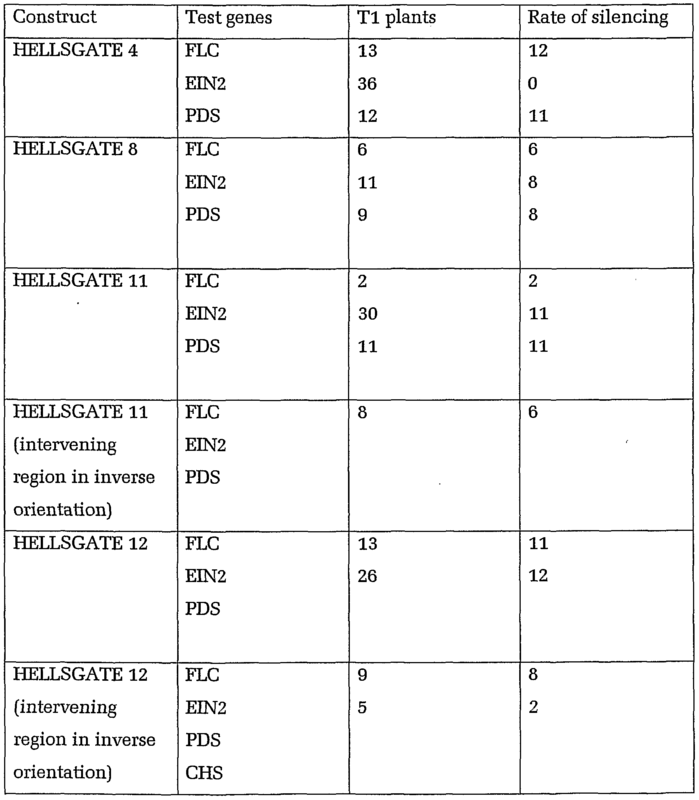 The results of the analysis of plants transformed with the different pHELLSGATE vectors are shown in Table 1. All plants transformed with pHellsgate 4-FLC and pHellsgate 8-FLC flowered significantly earlier than wildtype C24 and in both cases plants flowering with the same number of rosette leaves as the flc-20 line (carrying a stable Ds insertion in the first intron of the FLC gene) were observed. There was no clear difference in rosette leaves at flowering between the sets of plants transformed with the pHELLSGATE 4- FLC and pHellsgate 8-FLC constructs. A difference in the effectiveness of the pHELLSGATE 4-EIN2 and pHELLSGATE 8- EIN2 plants was observed. Of 36 transformants for pHG4-EIN2 there were no plants with an observable ACC-resistant phenotype under the conditions used for this experiment, whereas 8 of the 11 plants carrying the pHG8-EIN2 transgene showed some degree of ACC-resistance. The extent to which the pHG8-EIN2 plants were resistant to ACC was variable indicating that the severity of silencing varies between transformants. The great majority of plants carrying pHG4-PDS and pHG8-PDS showed a phenotype consistent with the loss of photoprotection due to the absence of carotenoids. The weakest phenotype was a bleaching of the cotyledons, with the true leaves not bleaching at any stage in the life cycle. The bleached cotyledon phenotype was only seen in plants transformed with PDS hpRNA constructs; we confirmed that the plants with this phenotype also contained the PDS hpRNA construct (data not shown) strongly suggesting that this phenotype is due to PDS silencing and not bleaching from the kanamycin selection. Plants transformed with the pHELLSGATE 4-PDS construct gave only this weak bleached cotyledon phenotype. In contrast the five of the pHELLSGATE 8-PDS plants had the weak phenotype and three showed a stronger phenotype with extensive or complete bleaching of the true leaves. 1. A vector comprising the following operably linked DNA fragments: a) an origin of replication allowing replication in a recipient cell (1), preferably in bacteria; particularly in Escherichia coli. b) a selectable marker region (2) capable of being expressed in said recipient cell; and c) a chimeric DNA construct comprising in sequence: i) a promoter or promoter region (3) capable of being recognized by RNA polymerases of a eukaryotic cell; ii) a first recombination site (4), a second recombination site (5), a third recombination site (6) and a fourth recombination site (7); iii) a 3' transcription terminating and polyadenylation region (8) functional in said eukaryotic cell; wherein said first recombination site (4) and said fourth recombination site (7) are capable of reacting with a same recombination site, preferably are identical, and said second recombination site (5) and said third recombination site (6), are capable of reacting with a same recombination site, preferably are identical; and wherein said first recombination site (4) and said second recombination site (5) do not recombine with each other or with a same recombination site or said third recombination site (6) and said fourth recombination site (7) do not recombine with each other or with a same recombination site. 2. The vector of claim 1, wherein said first (4) and second recombination site (5) flank a second selectable marker gene (10) and said third (6) and fourth recombination site (7) flank a third selectable marker gene (9). 3. The vector of claim 1 or 2, wherein said chimeric DNA construct comprises a region flanked by intron processing signals (11), functional in said eukaryotic cell, located between said second recombination site (5) and said third recombination site (6). 4. The vector of claim 3, wherein said region flanked by intron processing signals is an intron sequence functional in said eukaryotic cell. 5. The vector of any one of claims 3 or 4, further comprising a fourth selectable marker gene (19), located between said second (5) and third recombination site (6). 6. The vector of any one of claims 1 to 5, wherein said selectable marker genes are selected from the group consisting of an antibiotic resistance gene, a tRNA gene, an auxotrophic marker, a toxic gene, a phenotypic marker, an antisense oligonucleotide; a restriction endonuclease; a restriction endonuclease cleavage site, an enzyme cleavage site, a protein binding site, an a sequence complementary PCR primer. 7. The vector of any one of claims 1 to 6, wherein said promoter (3) is a plant- expressible promoter. 8. The vector of any one of claim 7, wherein said chimeric DNA construct is flanked by left and right border T-DNA sequences. 9. The vector of claim 8, further comprising a selectable marker gene capable of being expressed in plant cells located between said left and said right T-DNA border sequences. 10. The vector of claim 8 or claim 9, further comprising an origin of replication capable of functioning in Agrobacterium sp. 11. The vector of any one of claims 1 to 10, wherein said first (4) and fourth recombination site (7) is attRl comprising the nucleotide sequence of SEQ ID No 4 and said second (5) and third (6) recombination site is attR2 comprising the nucleotide sequence of SEQ ID No 5. 12. The vector of any one of claims 1 to 10, wherein said first (4) and fourth recombination site (7) is attPl comprising the nucleotide sequence of SEQ ID No 10 and said second (5) and third (6) recombination site is attP2 comprising the nucleotide sequence of SEQ BO No 11. 13. A vector comprising the sequence of SEQ ID No 13. 14. A vector comprising the sequence of SEQ ID No 23. 15. A vector comprising the sequence of SEQ ID No 24. 16. A vector comprising the sequence of SEQ ID No 25. 17. A vector comprising the sequence of SEQ ID No 26. 18. A vector comprising the following operably linked DNA fragments: a) an origin of replication allowing replication in a recipient cell (1), preferably in bacteria; particularly in Escherichia coli. b) a selectable marker region (2) capable of being expressed in said recipient cell; and c) a chimeric DNA construct comprising in sequence: i) a promoter or promoter region (3) capable of being recognized by a prokaryotic RNA polymerase; ii) a first recombination site (4), a second recombination site (5), a third recombination site (6) and a fourth recombination site (7); iii) a 3' transcription terminating and polyadenylation region (8) functional in said eukaryotic cell; wherein said first recombination site (4) and said fourth recombination site (7) are capable of reacting with a same recombination site, preferably are identical, and said second recombination site (5) and said third recombination site (6), are capable of reacting with a same recombination site, preferably are identical; and wherein said first recombination site (4) and said second recombination site (5) do not recombine with each other or with a same recombination site or said third recombination site (6) and said fourth recombination site (7) do not recombine with each other or with a same recombination site. 19. The vector of claim 18, wherein said RNA polymerase is a bacteriophage single subunit RNA polymerase. 20. A kit comprising the vector according to any one of claims 1 to 19. 21. The kit of claim 20, further comprising at least one recombination protein capable of recombining a DNA segment comprising at least one of said recombination sites. (5) and said sixth recombination site (14); vi) said DNA fragment of interest in opposite orientation (12); vii) a recombination site (18) which is the recombination product of said fourth (7) and said fifth recombination site (13); and viii) said 3' transcription terminating and polyadenylation region (8) functional in said eukaryotic cell; c) selecting said product DNA molecules. 23. The method according to claim 22, wherein said selecting is carried out in vivo. 24. The method according to claim 22 or 23, wherein said insert DNA is a linear DNA molecule. 25. The method according to claim 22 or 23, wherein said insert DNA is a circular DNA molecule. 26. The method according to any of claims 22 to 25, wherein said at least one recombination protein is selected from (i) Int and IHF and (ii) Int, Xis, and IHF. 27. The method according to any one of claims 22 to 25, wherein multiple insert DNAs comprising different DNA fragments of interest are processed simultaneously. 29. The method of claim 28, wherein said eukaryotic organism is a plant. 30. A method for isolating a nucleic acid molecule involved in determining a particular trait a) preparing a library of chimeric DNA constructs capable of expressing a dsRNA in cells of said eukaryotic non-human organism according to any one of the methods of claims 22 to 27; b) introducing individual representatives of said library of chimeric DNA constructs in cells of said eukaryotic non-human organism; c) isolating a eukaryotic organism exhibiting said particular trait; and d) isolating said nucleic acid molecule. 31. The method according to claim 30, wherein said eukaryotic organism is a plant. 32. A eukaryotic non-human organism comprising a chimeric DNA construct obtainable through the methods of any one of claims 22 to 27. 33. The non-human eukaryotic organism according to claim 31 which is a plant. ES2346645T3 (en) 2010-10-19 Methods and means of monitoring and modulating gene silencing.